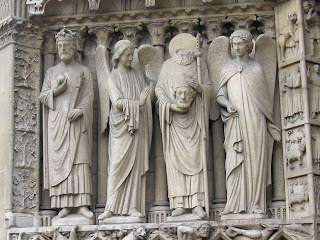 Saint Denis was the first bishop of Paris, back in the third century when Paris was still very much a Roman city. The prodigious number of conversions Denis performed got him on the bad side of the local pagan priests. 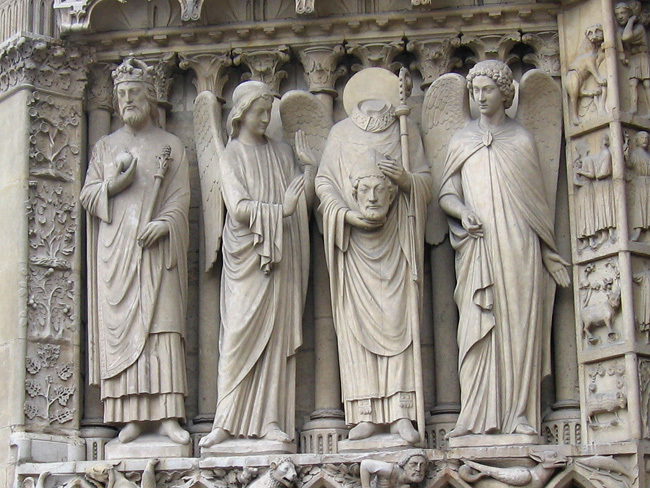 So the Roman rulers of Paris had Denis arrested and brought him to the highest hill in Paris, now known as Montmartre, where he was executed by — you guessed it — beheading. Now, here comes the good part: It's said that immediately after Denis was killed, he picked up his head and walked six kilometers to the North, and then finally died. The spot where he fell is now the town (technically a commune) called Saint Denis. He's now shown on plenty of artwork, he's got his own day, etc. And, funny enough, he's invoked primarily by prayer seekers for either demonic possession or...headaches.